Contact information for members of the following groups can be found ​here. The Minister is an essential member of the Worship & Life, Board of Trustees and Union Cemetery Board of Trustees. The Minister is also an ex officio member of all committees of the Pastoral Charge, except the Ministry & Personnel Committee. Voting members of the Executive Council are chairs of committees and Trustees. Everyone is welcome to attend meetings. For all matters that fall under the jurisdiction of the Trusts of Model Deeds. The Board of Trustees uses and administers all investments, lands, premises, and real and personal property acquired for the use of the Congregation on behalf of the United Church of Canada. The Worship and Life Committee (W&L) facilitates the spiritual life within the church and manages church communication and outreach to members, adherents and the community. W&L also oversees, with the Minister, the development and delivery of worship and special services. The Council of Stewards encourages and develops the potential of each member and adherent to use their time, talent, and financial resources in God’s service and ensures that the Church, including its buildings, furnishings and grounds are well maintained. The Ministry & Personnel Committee (M&P) is a confidential, consultative and supportive committee overseeing and supporting called and/or appointed personnel including paid staff, contract workers, and volunteers. 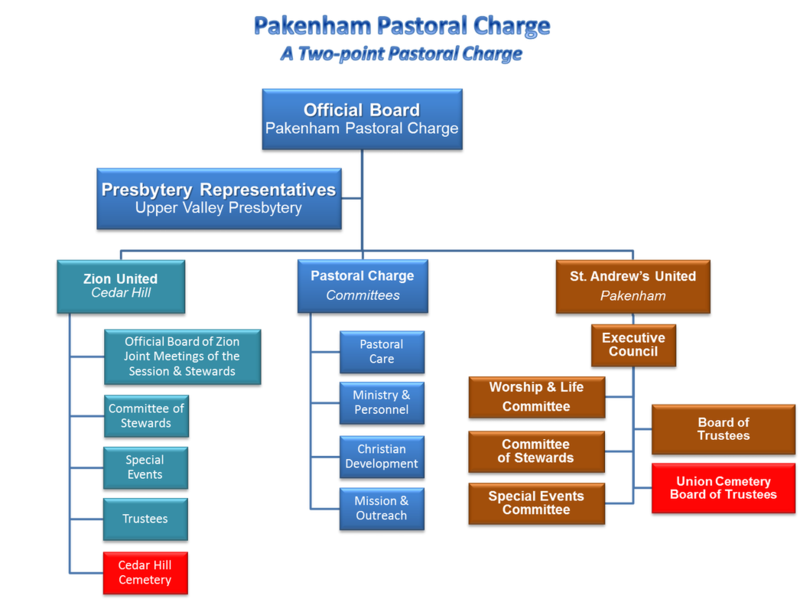 The M&P Committee oversees relationships within the pastoral charge, particularly the roles and functions of paid leaders and employees (such as the Minister, office administrator and custodial staff). The M&P Committee may also be involved in setting expectations for work carried out by volunteers. The Special Events Committee raises funds for the church, supports community outreach, provides opportunities for fellowship and camaraderie for church members and supports other committee initiatives as needed. ​Donna Fulton, Arlene Gillan, Marilyn Snedden.